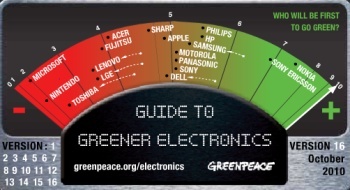 It will be three years in November since Nintendo set a low-water mark by becoming the first company ever to score a flat zero on the Greenpeace Guide to Greener Eletronics. It's been last-place finishes ever since for the House That Mario Built, but while it's been slowly creeping up the basement steps, Microsoft has been stumbling down them. Nintendo is still dead last on the list with a score of 1.8 out of ten, which is horrible no matter how you cut it but a definite step up from its January mark of 1.4/10 and a dramatic improvement over the "pitiful" 0.8/10 it racked up in April 2009. The company earned points for banning phthalates, "monitoring the use of antimony and beryllium" and using PVC-free internal wiring in its consoles. "E-waste criteria," however, remains its Achilles' heel and it also took a knock for increasing greenhouse gas emissions despite a commitment to cutting them. Microsoft comes in at a very close second-to-last finish with a score of 1.9 out of ten, down from 2.4 in January '10 and 2.7 in April '09. The company actually put together a (relatively) respectable mark of 2.9, but then lost a full point for backtracking on a commitment to phase out BFRs and PVCs by the end of 2010. BFRs and phthalates are now scheduled to be gone by the end of 2012, while the PVCs no longer have a clear date for elimination, a delay which did not impress the folks at Greenpeace. Sony remains way out in front of its console-making competitors with a score of 5.1 out ten, although it's mired in the middle of the pack overall, sharing sixth place with Panasonic and Motorola. Sony, of course, brings a lot more to the table than just game consoles, but scores well for having models of Vaio PCs, video recoders, digital cameras, portable media players and other equipment that are partially free of BFRs and PVCs. The company also gets a thumbs-up for its use of post-consumer recycled plastics in various products. It's a bit of an ugly scene for console makers, but scoring is always harsh in reports like this. It's not about congratulating companies for a job well done, after all, but reminding them, and consumers, that they can do more. Even the number one company on the list, Nokia, only came away with a 7.5 out of ten. Will this report keep anyone from picking up a Wii or a 360 over the holidays? Probably not. But it's a worthwhile note: You can do more, guys. So do more.